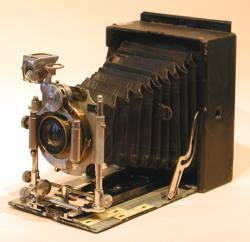 A 9 x 12 cm camera with a pneumatic shutter. 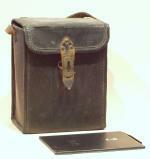 This 9 x 12 cm format camera is fitted out with a 150 mm f/6.8 Beckers Anastigmat lens with vertical and horizontal shift. The shutter is a Bausch and Lomb pneumatic type, shutter speeds being regulated by a little cylinder letting air slowly out. It might have been built at the turn of the 19th century (probably between 1895 and 1905). The bellows can be extended twice the length of the camera's front door for close-up work. Focusing marks indicate that it could be used with sheet and roll film. The mechanical parts, made of steel and brass, look very good. The pneumatic shutter gives speeds from 1/100 s to 1 s. The left-hand cilynder is the trigger while the right-hand one is the speed regulator. I don't know who built this camera. It could have been made by the French camera maker Girard who used this lens/shutter combination on several folders (including a model named Le Rêve, meaning The Dream). The Sirène (Mermaid) from the German camera maker Wunsche could also be a good candidate. Wunsche merged with Huttig in 1909 in the Ica firm bought in 1926 by Zeiss Ikon. I would be greatly interested by any information on this camera.